Although the above quote is not attributable to this typeface’s eponym — Diogenes of Sinope — but instead to Diogenes Laërtius, the epigram stands as a perfect allegory of Ludwig Übele’s latest effort. Diogenes is an elegant, seductive beauty that can be used in all kinds of designs, although its creator primarily had books, newspapers, and magazines in mind. It stands out from the bulk of new releases these days: hardly anyone has the courage to design a modern neoclassical typeface that considers its serifs fully independent parts of each character. While the strokes are rather strong, the serifs are rather thin. Maybe even too thin — in theory. In practice, they are just the thing to make Diogenes something special. I feel as if a gap has been filled that I didn’t even know existed. 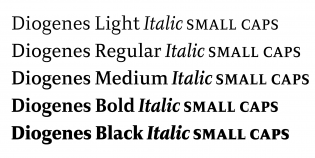 Further highlights can be found in the italics, especially the letters ‘Q’, ‘f’, ‘j’, and ‘z’, as well as in the complete new swash set, Diogenes Decorative. It’s tricky to apply Trajan’s serif principle to lowercase letters, as it tends to look outmoded. However, Übele’s solution appears so contemporary and modern that it makes me wish for more releases of this kind. Sure, type design is not simply about designing beautiful letters — but it should more often be about unusual approaches.